Stuffed pan cake "Jing Long Pao"
I have been looking for this recipe long time ago, finally I found in My Kitchen Snippets.., immediate I give a try, the result was so good, exactly like that one I use to buy in pasar pagi (market). My daughter love this pan cake so much, keep asking me to do it, as we can't find that stall in pasar pagi anymore, don't know when it gone missing ....I don't know how to call this pan cake in Mandarin, Felvinc told me it called as "jing long pao"..
3. 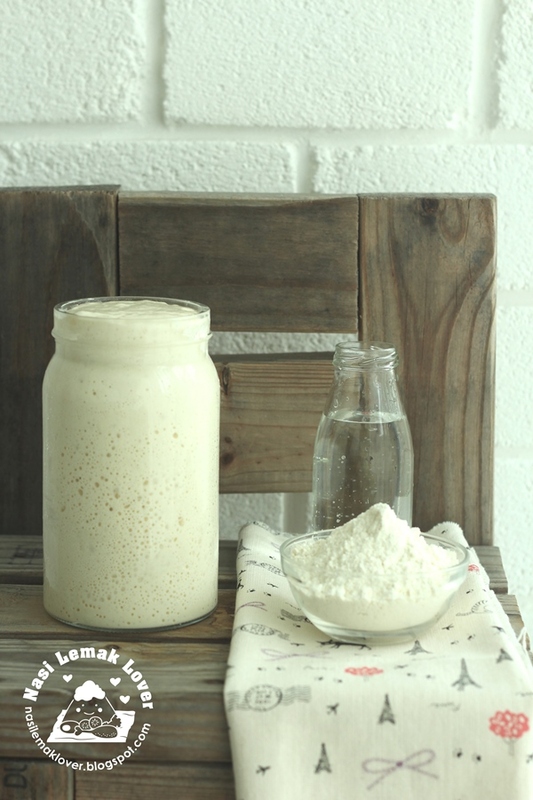 Knead the dough till smooth. 4. Leave to prove until double in size. 5. Divide the dough into small balls, and put in the filling. Set aside and rest. 7. Use spatula to flatten the pan cake while frying. 8. Fry till both sides of pan cake turned brown. p/s This bread does not requires oven, so if you don't have a oven, you can bake this too..
Million Thanks to My Kitchen Snippets for this great recipe..
1. Wash and clean the Lala(clams). 2. Add in Superior chicken stock (I use the instant Maggi brand chicken stock), shredded ginger, light soy sauce, "Hua Tiao Chew" Chinese wine, sugar, salt, garlic oil, shredded red chili, chili padi (optional), spring onion and ground pepper. 3. Steam for 5mins and serve hot. - My husband proposed himself to cook this sambal petai, he really just cook it only, because all those ingrediants e.g homemade chili paste, prawn, petai, onion & etc are prepared by me...I'm became the assistant to the Cook on that day... Anyway, I admit that he cooked quite well on this dish..
-In return, I prepared this Mango Lassy for him. I use the mango imported from India(bought from Jusco), this India mango is super sweet and very aroma. I prefer this Nyonya Chang than the normal Hokkian Bak Chang, because this chang is not so oily and I like the aromatic from the spices, and also like the little sweetness from the candied winter melon. - Since this was my first time to wrap dumpling, I still can not get the perfect shape, need to try few more times. 2. Add bean paste and coriander paste and continue fry. 3. Add in pork, mushrooms and winter melon, mix well. 4. Add some water, season with soy sauce, pepper , sugar and salt. 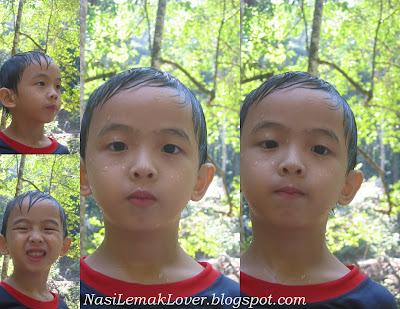 Since I ever became blogger, I enjoy taking pictures, these are some random shots during the short trip to Hutan Lipur Lentang. Even we are not a Hakka people, but we like to eat this popular Hakka dish. This dish is easy to cook but just need longer time to braise it. If you dont want to braise, just eat the deep fried Hakka meat, also a good choice. 1. Marinate pork belly for few hours, coat with egg and flour, deep fried till golden brown and set aside. 2. Saute garlic, put in red fermented bean curd and bean sauce, then add in black fungus. 3. Add in enough water and fried pork meat, bring to boil, lower the heat, continue simmer for 45mins or until meat is tender, tasted with salt and sugar. 4. Dish out and serve. Discovered this great recipe from my old recipes collection, immediately I gave a try today. Why it called as Japanese-style of sweet bun, I think because it consists of few Japanese ingredients. This bun is full of flavours, sweet, sour and salty...you should give a try..
1. Ready the sweet bun bread dough and rest well. 2. Divide the dough into small ball shape, fill it with the filling, and keep aside to rest until double size. 3. Cut Japanese seaweed into small rectangular size, brush with egg and place on top of the bun. 4. Bake in pre-heat oven at 200c for 15mins. I managed to bake 12 buns and kids finished 10 buns in just few hours and keep 2 buns to bring to school tomorrow morning, so you can imagine how nice is this bun !! We found this interesting place when we on the way back from The Elephant Santuary the other day and to keep our promise, we brought our kids to this place during this short school term holidays. - We purposedly reached there early morning, so we can enjoyed breakfast there. 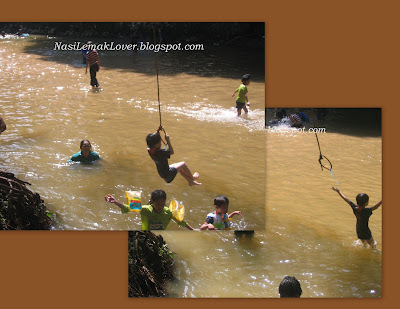 - After the breakfast, kids immediately jump into the cool water and enjoying bathe..
-Few areas have a lot of rocks and stream was flowing quite rapidly... not very safe for kids swimming near this area. - Desmond dared to play the swing and actually he did quite well. -We also enjoyed our lunch there, our favorite Nasi Lemak and some fried stuffs. Direction: Look out "Hentian Hutan Lipur Lentang" sign board along the Karak highway, turn your left when you see this sign board if you come from KL....We took about 1 hour to reach there from Klang. Sometime I need to show you what meals I taken in outside restaurants, otherwise it will be too boring just talking on the same topic of what I cooked and baked right? This is our usual seafood restaurant and it is located very near to my house. - My husband's favorite steamed Lala (clams) , that day the lala was a bit small, sometime they do have big lala. The stock was so sweet and contains very strong wine aroma. My husband even said this is better than that one serve in Lala Chong Seafood Restaurant. 162, Kg. Perepat, Batu 8, 42200 Kapar, Selangor. ** for this meal, total bill came up to RM 110 ( included rice, drink and meals), 4 adults and 2 kids, reasonable isn't it? The other day saw Felvinc posted on 辣椒板面, then realized that I have a pan mee (pasta) making machine which I have not used it for quite a long time, immediately I cook my kid's favorite spinach pan mee which I have not cooked for long time. - To accompany with a bowl of sayur manis soup with fish balls. - I also prepared the dried chili paste and added hard-boiled egg which are the hot items from the 辣椒板面 shop. ** Due to camera run out of battery, this photo was taken using mobile phone, sorry for the poor quality of photo. 1. Cut dried chili into 2-3 pcs and wash clean. 2. Dry under hot sun. 3. Heat oil, quick fry dried chili (change colour), set aside to cool. 4. Blend fried dried chili coarsely, tasted with salt and sugar. 5. Add little chili oil and ready to eat with pan mee. * I never tasted 媚姨的辣椒板面 dried chili paste before, this was cooked using my own imagination, but it tasted really good. The rest of toppings- cooked minced pork meat, blanched bean sprout, fried ikan bilis and fried shallots. p/s I will try to bake again, and will share recipe if I manage to get good muffin. 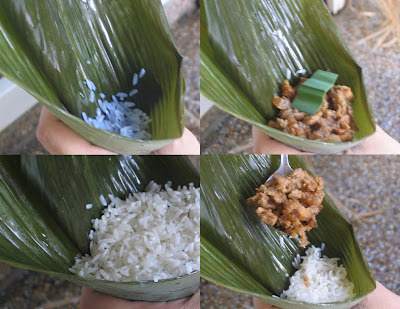 Minced Pork " Loh Si Fun "